Balustrade-holding Yaksa, Madhya Pradesh, Sunga period (2nd-1st century B.C.E.). Musee Guimet. The beginning of larger, centralized polities in India was largely in response to Alexander the Great's invasion of 326. Following the Mauryan Empire, the task of protecting India from invasion and of securing stable governance fell to the Sunga dynasty for the next century. War is said to have characterized this period although the Sungas also engaged in diplomacy. Significant religious developments took place. Patanjali's synthesis of the tradition of Yoga became the foundation of one of the Hindu "darshans" (schools of thought) and continues to enrich the lives of people all over the world. The Bhagavad Gita composed around about 150-100 B.C.E. is one of the most popular of all Hindu scriptures. Buddhists would later move out of India, as rulers began to identify more closely with Hinduism but early Sunga support may have enabled Buddhism to thrive long enough for the monks to complete their journey to more receptive areas. The Sunga Empire played an important role in patronizing Indian culture at a time when some of the most important developments in Hindu thought were taking place. The richness of India's spiritual tradition, from which the whole world has gained insight, owes much to this period. The Sunga dynasty was established in 185 B.C.E., about 50 years after Ashoka's death, when the king Brhadrata, the last of the Mauryan rulers, was assassinated by the then commander-in-chief of the Mauryan armed forces, Pusyamitra Sunga ("Pusyamitra is said in the Puranas to have been the senānī or army-commander of the last Maurya king Brhadratha") while he was taking the Guard of Honor of his forces. Pusyamitra Sunga then ascended the throne. Pushyamitra Sunga became the ruler of the Magadha and neighboring territories. The kingdom of Pushyamitra was extended up to Narmada in the south, and controlled Jalandhar and Sialkot in the Punjab in the north-western regions, and the city of Ujjain in central India. The Kabul Valley and much of the Punjab passed into the hands of the Indo-Greeks and the Deccan to the Satavahanas. Pushyamitra died after ruling for 36 years (187-151 B.C.E.). He was succeeded by son Agnimitra. This prince is the hero of a famous drama by one of India's greatest playwrights, Kalidasa. Agnimitra was viceroy of Vidisha when the story takes place. The power of the Sungas gradually weakened. It is said that there were ten Sunga kings. The Sungas were succeeded by the Kanva dynasty around 73 B.C.E. Yaksa reliefs. Bharhut, second century B.C.E. Then King Pusyamitra equipped a fourfold army, and intending to destroy the Buddhist religion, he went to the Kukkutarama. (…) Pusyamitra therefore destroyed the sangharama, killed the monks there, and departed. After some time, he arrived in Sakala, and proclaimed that he would give a hundred dinara reward to whomever brought him the head of a Buddhist monk" (Shramanas) Ashokavadana. Later Sunga kings were seen as amenable to Buddhism and as having contributed to the building of the stupa at Bharhut. Brahmanism competed in both the political and spiritual spheres with Buddhism in the gangetic plains. Buddhism flourished in the realms of the Bactrian kings. Buddhism, with no priests or classes, attracted a large lay following, while Brahmanism privileged the priestly class and offered little for non-Brahmans by way of a spiritual life. Patanjali also represented an alternative, teaching Yoga and devotion that anyone could practice, regardless of class or caste. Some date Bhagavata Gita from this period, which became the favorite text of the Bhakti tradition. It also challenges an elitist religion. Runion says that the Sunga spread Hinduism into Afghanistan, however, where they "eliminated Buddhism." However, the Gita is also tolerant of religious diversity, regarding different paths and names for God as alternatives that lead to the same goal. There is only one Ultimate Reality but this reality manifests in a plurality of ways, each revealing different aspects or qualities of the same Reality. 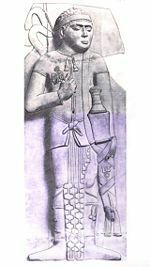 Vedika pillar with Greek warrior. Bharhut, Madhya Pradesh, Sunga Period, c. 100-80B.C.E. Reddish brown sandstone. Indian Museum, Calcutta (drawing). War and conflict characterized the Sunga period. They are known to have warred with the Kalingas, Satavahanas, the Indo-Greeks, and possibly the Panchalas and Mathuras. The Sunga Empire's wars with the Indo-Greek Kingdom figure greatly in the history of this period. From around 180 B.C.E. the Greco-Bactrian ruler Demetrius, conquered the Kabul Valley and is theorized to have advanced into the trans-Indus. The Indo Greek Menander is credited with either joining or leading a campaign to Pataliputra with other Indian Kings; however, very little is know about the exact nature and success of the campaign. The net result of these wars remains uncertain. The Anushasanaparava of the Mahabharata affirms that the city of Mathura was under the joint control of the Yavanas and the Kambojas. Then, after having approached Saketa together with the Panchalas and the Mathuras, the Yavanas, valiant in battle, will reach Kusumadhvaja ("The town of the flower-standard," Pataliputra). Then, once Puspapura (another name of Pataliputra) has been reached and its celebrated mud[-walls] cast down, all the realm will be in disorder. Bronze coin of the Sunga period, Eastern India. Second-first century B.C.E. Pushyamitra is recorded to have performed two Ashvamedha Yagnas and Sunga imperial inscriptions have extended as far as Jalandhar. Scriptures such as the Divyavadhana note that his rule extended even farther to Sialkot, in the Punjab. Moreover, if it was lost, Mathura was regained by the Sungas around 100 B.C.E. (or by other indigenous rulers: The Arjunayanas (area of Mathura) and Yaudheyas mention military victories on their coins ("Victory of the Arjunayanas," "Victory of the Yaudheyas"), and during the first century B.C.E., the Trigartas, Audumbaras and finally the Kunindas also started to mint their own coins). Accounts of battles between the Greeks and the Sunga in Northwestern India are also found in the Mālavikāgnimitram, a play by Kālidāsa which describes a battle between Greek cavalrymen and Vasumitra, the grandson of Pushyamitra, on the Indus river, in which the Indians defeated the Greeks and Pushyamitra successfully completed the Ashvamedha Yagna. Nevertheless, very little can be said with great certainty. However, what does appear clear is that the two realms appeared to have established normalized diplomatic relations in the succeeding reigns of their respective rulers. 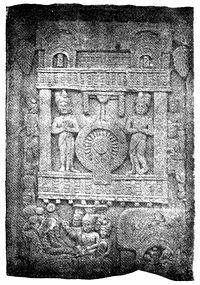 The Indo-Greeks and the Sungas seem to have reconciled and exchanged diplomatic missions around 110 B.C.E., as indicated by the Heliodorus pillar, which records the dispatch of a Greek ambassador named Heliodorus, from the court of the Indo-Greek king Antialcidas, to the court of the Sunga king Bhagabhadra at the site of Vidisha in central India. While there is much debate on the religious policies of the Sunga dynasty, it is recognized for a number of contributions. Art, education, philosophy, and other learning flowered during this period. Most notably, Patanjali's Yoga Sutras and Mahabhasya were composed in this period. It is also noted for its subsequent mention in the Malavikaagnimitra. This work was composed by Kalidasa in the later Gupta period, and romanticized the love of Malavika and King Agnimitra, with a background of court intrigue. Artistry on the subcontinent also progressed with the rise of the Mathura school, which is considered the indigenous counterpart to the more Hellenistic Gandhara school of Afghanistan and Pakistan. During the historical Sunga period (185 to 73 B.C.E. ), Buddhist activity also managed to survive somewhat in central India (Madhya Pradesh) as suggested by some architectural expansions undertaken at the stupas of Sanchi and Barhut, originally started under King Ashoka. It remains uncertain whether these works were due to the weakness of the control of the Sungas in these areas, or a sign of tolerance on their part. The last of the Sunga kings was Devabhuti (83-73 B.C.E.). He was assassinated by his minister (Vasudeva Kanva) and is said to have been over fond of the company of women. The Sunga dynasty was then replaced by the subsequent Kanvas. 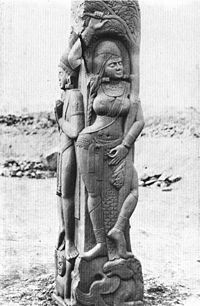 Sunga Yakshi, second-first century B.C.E. Sunga masculine figurine (molded plate). Second-first century B.C.E. Sunga woman with child. Second-first century B.C.E. Sunga Yaksa. Second-first century B.C.E. Sunga fecundity deity. Second-first century B.C.E. The script used by the Sunga was a variant of Brahmi, and was used to write the Sanskrit language. The script is thought to be an intermediary between the Maurya and the Kalinga brahmi scripts. The Sunga Empire played an important role in patronizing Indian culture at a time when some of the most important developments in Hindu thought were taking place. The richness of India's spiritual tradition, from which the whole world has gained insight, owes much to this period. The Sunga rulers helped to establish the tradition of royal sponsorship of learning and art that would be continued by later dynasties, ensuring that Indian culture remained vital and creative. ↑ Akira Hirakawa and Paul Groner, A History of Indian Buddhism: From Sakyamuni to Early Mahayana (Delhi, IN: Motilal Banarsidass Publ., 1996, ISBN 8120809556), 223. ↑ Ashok Kumar Anand, Buddhism in India (New Delhi, IN: Gyan Books, 1996, ISBN 9788121205061), 91-93. ↑ MBH 12/105/5, Kumbhakonam 1910 edition. ↑ Dilip Coomer Ghose, The Asiatic Society, Kolkata, 2002. ↑ J.W. McCrindle (trans. ), Arr. Ind. 10. "Of Pataliputra and the Manners of the Indians," Ancient India as Described by Megasthenes and Arrian (Calcutta and Bombay, IN: Thacker, Spink), 30-174. Retrieved November 22, 2008. ↑ Mitchiner (2002), Paragraph 47-48. ↑ Osmund Bopearachchi, Indo-Greek, Indo-Scythian and Indo-Parthian Coins in the Smithsonian Institution (New Delhi, IN: Manohar, 1992, ISBN 9780043940017), 16. ↑ M.R. Kale Kālidāsa and Ramji Thakur, Malavikagnimitraṁ: Malavika and Agnimitra (Delhi, IN: Global Vision Publ. House, 2004, ISBN 9788182200142). ↑ Proel Apartado, Silabario Sunga. Retrieved November 22, 2008. Jha, D.N. 2004. Early India: A Concise History. New Delhi, IN: Manohar. ISBN 9788173045783. Keown, Damien. 2003. A Dictionary of Buddhism. Oxford, UK: Oxford University Press. ISBN 9780198605607. Mitchiner, John E. 2002. The Yuga Purāṇa: Crit. Ed., with an Engl. Transl. and a Detailed Intro. Bibliotheca Indica, 312. Calcutta, IN: Asiat. Soc. ISBN 9788172361242. Runion, Meredith L. 2007. The History of Afghanistan. The Greenwood Histories of the Modern Nations. Westport, CT: Greenwood Press. ISBN 9780313337987. Strong, John. 1983. The Legend of King Asoka, A Study and Translation of the Asokavadana. Princeton, NJ: Princeton Library of Asian translations. ISBN 0691014590. Thapar, Romila. 2005. Aśoka and the Decline of the Mauryas: With New Afterword, Bibliography, and Index. New Delhi, IN: Oxford Univ. Press. ISBN 9780195644456. Sunga art in North India (Bharhut and Bodgaya). This page was last modified on 27 October 2015, at 16:34.